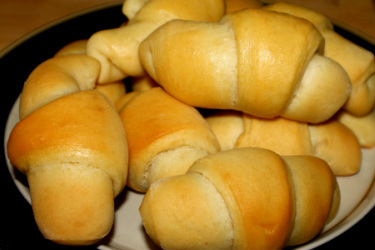 We love to serve our crescent rolls with our Railroad Dinner Deluxe -- you can find the recipe here. *the original recipe calls for the use of a mixer but I used good old arm strong power, and mixed and kneaded everything by hand. Add half of the flour and mix completely. Add the remaining flour, incorporating the flour until it is completely mixed in. I did this with my hands. I then kneaded the dough in the bowl by hand, with a 1/4 turn of my bowl with each fold. The end result was a light and soft, non-sticky dough. Place it in a greased bowl and cover with a towel. Place in a warm area of your kitchen where there are no drafts. Let it double in size. Punch the dough down, and then separate into 2 halves. Roll out each half into a pizza shaped circle, about 1/2 inch in thickness. I cut mine into 12 wedges each, but you could cut them larger if preferred. I wanted small dinner roll sized buns. Roll up each wedge, from the large end to the point and place point side down on a prepared baking sheet. Cover and let rise again. Bake at 350 degrees for 15 - 20 minutes until the rolls are a wonderful golden brown color.